If you live in USDA Hardiness Zone 8 or lower, bring your angel trumpets inside when freezing weather approaches. In anticipation of the plant’s overwinter needs, many gardeners choose to grow their angel trumpets in outdoor containers to facilitate an easy move indoors. If your angel trumpet is growing in the ground, you must dig it up and place it in a container. Once in a suitable pot, overwinter your angel trumpet in sunny and cool conditions. 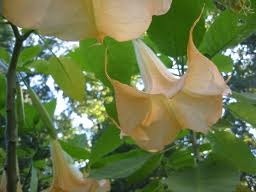 Remove your angel trumpet from the ground, if necessary. Water the angel trumpet before you begin digging to hydrate the plant and make the soil easier to work. Dig around the plant in a circle that 1 1/2 times the diameter of the spread of the foliage. Undercut the root ball with your shovel. Place the root ball and plant in a potting container. Fill in any gaps in the potting container with moistened commercial potting soil. Place the angel trumpet indoors in a spot where it will receive full sunlight and temperatures are consistently between 45 and 55 degrees Fahrenheit (ideally, or at least above freezing). Check the soil’s moisture level once every two weeks. When the top 3 inches of the soil dry out, add just enough water to re-moisten (bot not soak) the soil. This reduced watering will restrict the angel trumpet’s growth and force it into dormancy. 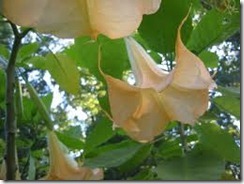 Move the angel’s trumpet back to its original growing position in spring. Water the plant well and lightly prune its foliage to stimulate new growth. It is normal for your angel trumpet to loose its leaves during winter.